Peiyan.Photography: What Have I Learnt About Assessment? This was the summary question to today's physics lecture on Assessment. 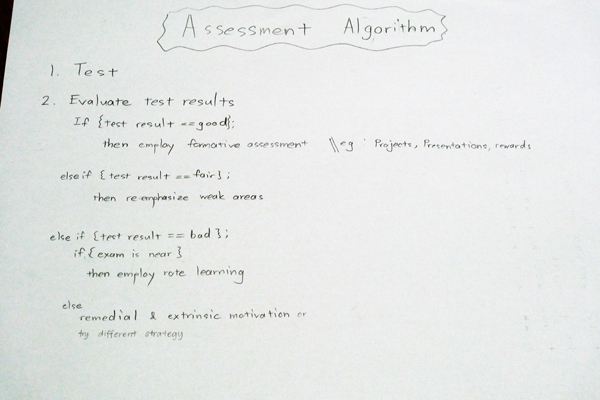 In fact, all the 3 classes that I had today talked, discussed, described, explained... about ASSESSMENT. That's like an overdosage of Assessment for my little brain cells. To answer the question, Glen, Geok Lan, Czarina and I thought of funny things. Actually, we were feeling a bit crazy after Dr Ho's math tutorial. He was going through what assessment is and the discussions were to think which of the 2 given choices is relevant. See if the student know their Mathematical stuff. See if the students listen to my teaching. See if I am a good teacher. See what the students do not know or understand. These are not the exact words. I just phrase them to my best memory ability. Basically, we had fun and translated these "answers" to physics lesson. Finally, Rion even made use of what one of the classemate's formulae that "Assessment = Testing + Evaluation" to answer the lecture's question during Maths lecture right after physics class. That's 3 consecutive lessons on assessment. The second semester of NIE has begun and things are moving very fast. We have only 6 weeks to spare before we enter the gates of Practicum. For some reason, I created an entry today.